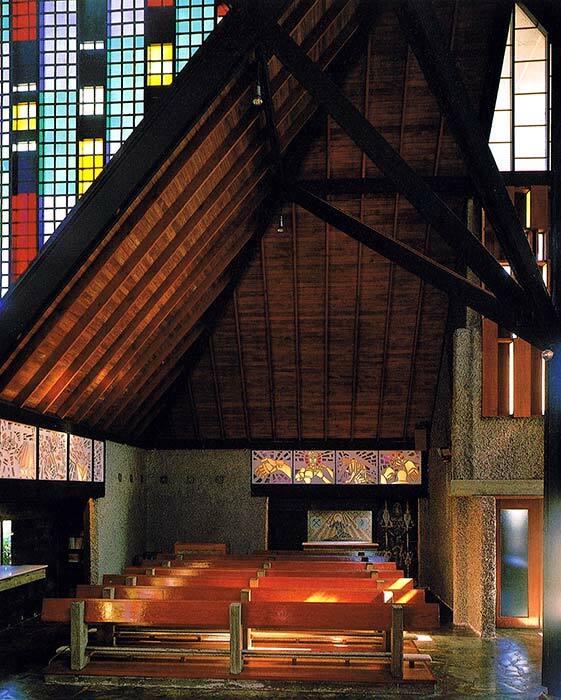 Futuna Chapel in the Wellington suburb of Karori is arguably New Zealand's most accomplished ecclesiastical building. Designed by the Māori architect John Scott, it blends modernist, Pākehā and Māori elements to create a vernacular building. Futuna opened in 1960 as the chapel of the Marist Brothers, a Catholic order. The Brothers sold the site in the 1990s and housing was built around the chapel. Concerns that it was falling into disrepair saw a community trust formed to buy and care for it. Photograph from Russell Walden, Voices of silence: New Zealand's Chapel of Futuna. Wellington: Victoria University Press, 1987, courtesy of the estate of John Scott.